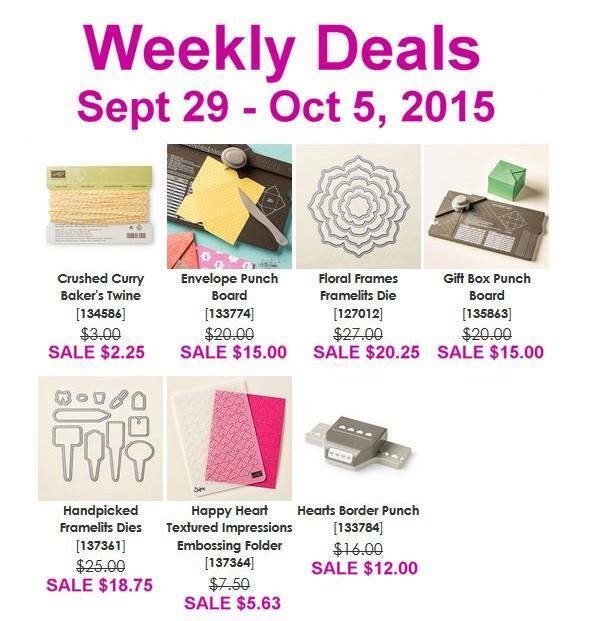 Deals this week are super! Lots of great goodies, but do yourself a favor – with the holidays looming in the (not so far) distance, pick up the Envelope Punch Board or the Gift Box Punch Board – or just break down and get them both. I can’t tell you how often those two have saved my sanity at the last minute. You’d be amazed at the impact you’ll get with a box created with Designer Series Paper! Shop HERE. Announcing the 2016 Calendar kit! Kits will begin shipping November 1st, and will contain 12 calendar month pages printed on Whisper White plus a cover page announcing the year. You will also receive 13 card stock mats in colors that will coordinate well with the seasons of the year. Finally, I’ll include a clear box tor presenting your calendar as a gift when you choose the kit with the easel. This year’s calendar includes a selection of mats featuring all 10 In Colors plus 3 of my faves to round out the bunch. You’ll get Hello Honey, Tangelo Twist, Blushing Bride, Watermelon Wonder, Cherry Cobbler, Blackberry Bliss, Lost Lagoon, Mint Macaron, Bermuda Bay, Cucumber Crush, Mossy Meadow, Delightful Dijon, and Tip Top Taupe. These calendars are fun to create and make great gifts. The petite format allows you the freedom to be as Clean-and-Simple or Fussy-cut-Water-colored-Over-the-Top as you like! Payment is through SQUARE, protecting your credit information and providing the best options. Please send your email address and the kits you would like to AnneMatasci (at) gmail (dot) com and I will forward an invoice. I will ship the kits November 1st – be sure to include your shipping address. For calendar inspiration, type “DIY Easel” into the Maui Stamper search box – I’ve been making and sharing these calendars since 2013, so there are lots of ideas! Thanks, Gail! I’m glad you enjoy them.